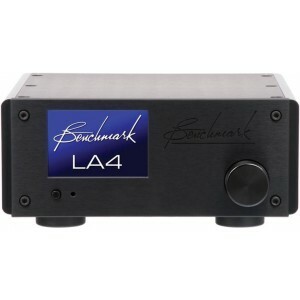 LA4 is identical to HPA4 but without headphone outputs making this the ideal ultimate line amplifier for those who do not need the headphone amplifier. Earn 2749 loyalty points when you order this item. 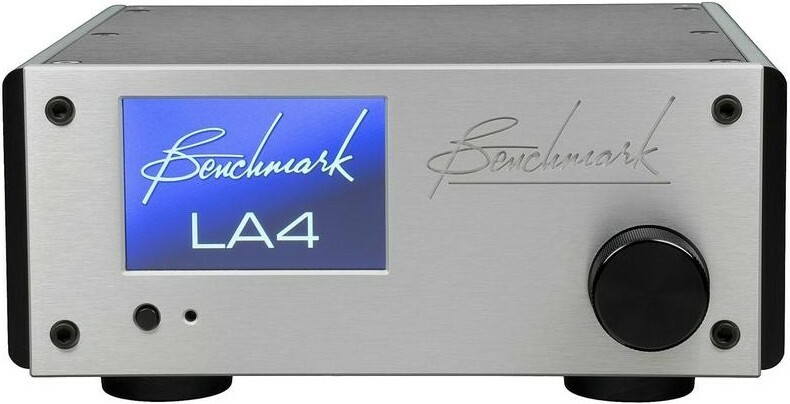 Benchmark LA4 Line-Level Preamplifier is designed to sit between a reference-quality DAC and power amplifier. Hi-fi preamps conventionally use volume control and input switching which introduce significant noise and distortion. LA4 is fully relay controlled and employs analogue amplifiers with exceedingly low distortion; relay gain control, relay input selection and relay muting and features the finest gold-contact relays available. Relay closures are accurately timed to deliver silky-smooth volume changes for an unrivalled level of performance. LA4 includes 2 independent 256-step attenuators: one for the left channel and one for the right. To make this all happen, LA4 includes 40 precision relays that switch high-precision metal-film resistors. Entirely analogue, LA4 can be driven by external DACs and line-level analogue sources. It will power any pro or hi-fi power amplifier and provides the flagship analogue signal path between inputs and outputs. LA4 exceeds the performance of typical preamps by achieving lower noise and distortion. 0The relay-controlled gain stage optimises attenuation to suit the analogue source to downstream power amplifier at any volume setting. This delivers optimal system SNR for each volume setting. 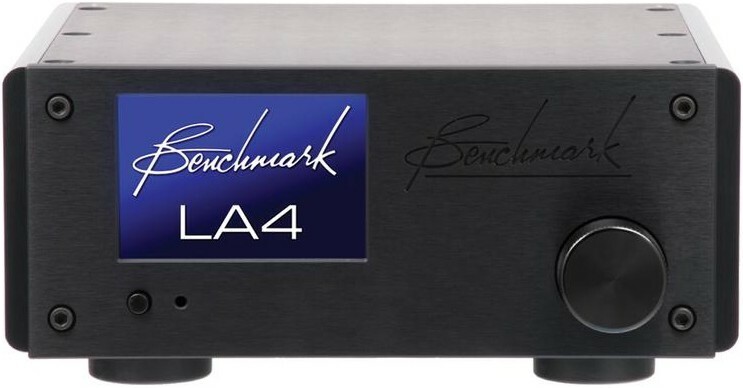 LA4 will match high-output DACs to low-input power amplifiers and will grant an optimised interface between high-level and low-level balanced or balanced and unbalanced devices. LA4 extends from 0.01 to over 500k Hertz for very precise amplitude and phase accuracy across entire audio bandwidth. Wave shapes are precisely reproduced, and the full spectrum is delivered with accurate timing. LA4 delivers life-like musical overtones rendering musical instruments without changing their sonic character. LA4 features dual balanced and unbalanced stereo inputs. The line amplifier provides balanced stereo output and mono sum, and unbalanced stereo output. LA4 features IR remote control and can function via the optional Benchmark remote. Designed for Benchmark DAC2 and DAC3 converters, it can also be driven by any premium DAC. Pairing with a Benchmark DAC enables control of both units from a single remote. The LA4 is the perfect complement to the Benchmark AHB2 as it is perhaps one of the only preamps to exceed the AHB2’s ultra-quiet signal to noise ratio for extraction of the full performance. LA4 and HPA4 are the only amps recommended between a DAC i.e DAC 3 and the AHB2 to prevent degrading of system noise performance. LA4 will replace DAC3's 32-bit digital gain control with a more-resolving fully-analogue relay gain control. Twin bidirectional 12V trigger ports can link LA4 with external DACs and power amplifiers controlling the power-up and power-down sequence of the entire system. The trigger ports are suitable for most standard trigger ports and can communicate bi-directionally with other Benchmark products. Easy access to advanced is provided by the touch screen such as balance control, input level offsets and names, screen dimming, remote control and function locking. The volume dial features a premium optical encoder rated for heavy use. An acceleration feature eases moving through the 256 volume steps while retaining 0.5dB/step resolution. A press will wake or brighten the screen when using sleep or auto-dim functions. -20dB "audio dim" button instantly reduces the level by 20dB and temporarily reduces the volume so you can effortlessly transition between normal listening and background level. Screen brightness is adjustable and timers can be set to dim or shut off the display. Input levels can be trimmed to give input-to-input level matching. The screen lock can block access to advanced features. LA4 comes with a black or silver fascia designed to match Benchmark AHB2 power amplifier and features the same footprint as Benchmark DAC1, DAC2 and DAC3 models. The milled faceplate and sides of the case are coupled with thick aluminium top, bottom and rear panels featuring a brushed texture. LA4 is built for longevity and makes an exceptional addition to your listening space.